Gmail just went through a major upgrade to version 2.0 where they changed the way Gmail messages loaded and implemented pre-fetching. Today, they have implemented a feature, Colored Labels, that was previously available as a Greasemonkey script. Labels are a great way of organizing your emails. Combined with Gmail Filters, I can automatically add labels to different mails based on who I get it from or what the subject says or the content of the email. 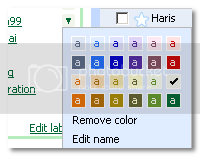 Now, I can assign one of 24 color options I have from a drop down panel on the side of the labels. This is going to make recognizing important emails from the bunch of emails I get, so easy! Plus, you can visually scan through hundreds of messages with your eyes trained for the label colors. I have plenty of labels and I think the best for me to use this feature is to start off lightly with the colors. I am going to give some bright colors to labels that are most important for me at the moment using the colors with dark background and light letters. The rest of the labels are going to get the light background with dark colors to aid identification. Gmail also has added the ability to view the attached labels with in a message with the color assigned to it. You could remove labels right within the Gmail message. The best thing about this is, all your new messages have the ‘Inbox’ label assigned to it and you can archive a message that you have just read with a single click on the x mark. Google Blogoscoped is reporting that Google is rolling out a web based client for AOL Instant Messenger as part of Gmail. Google is simply using the Open AIM framework to facilitate this. This means that you will be using your AIM account to sign-in every time you want to talk to other AIM users. I don’t have this feature in my Gmail yet but I thought it might be of interest to some of you who use AIM. It doesn’t look like Google is pushing all these new functionality we see in Gmail Chat to their desktop counterpart. P.S. We actually kinda like folders. In fact, we’re doing some work to add some folder-y-ish functionality. Stay tuned. I am curious to know what you think about these new developments as a Gmail user. If you are a Yahoo or some other webmail user, I would love to hear if this is making you curious about Gmail. I love these new labels. Very handy!